Customer support : contact form, email, FAQ. Freebies.com is not really classified as an online lottery site, even though both offer members the opportunity to win great prizes. Online lottery sites, by definition, require you to pay for lottery tickets up front and then pay you out if you win. Some online lottery sites don’t offer the option to purchase tickets, but rather facilitate bets on the outcome of lottery draws. Either way, they are moons apart from how a site like Freebies.com functions. Freebies.com offers an extensive range of prize draws, point schemes and giveaways, and you do not have to pay any money in order to participate in any of these. The Members Only Prize Draws are the main attraction to the site and allows members the opportunity to pick specific prizes to win. Members of Freebies.com can visit the Members Only draw page to see what prizes are currently up for grabs and can then use their accumulated points to purchase entry tickets for those draws. Each entry ticket costs 50 points and you can enter by clicking on the “Win This” button. After clicking this button, you can then decide how many tickets you want to buy for that draw and the maximum amount of tickets is 50. Members can also enter the Freebies.com Daily Draws competitions which offer daily cash prizes. Entry is limited to one per day and cost 100 daily points to enter. You can log into the Freebies.com website from your preferred mobile device. 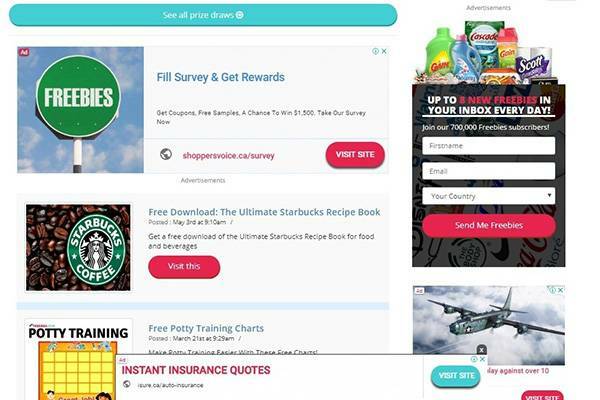 Thanks to the wonders of smart browsing technology, the Freebies.com website will automatically adjust to your mobile device without the need for any apps. Whether you use an Android device, iOS, Windows or Blackberry smartphone or tablet, logging in to or signing up to Freebies.com from your mobile device is quick and easy. 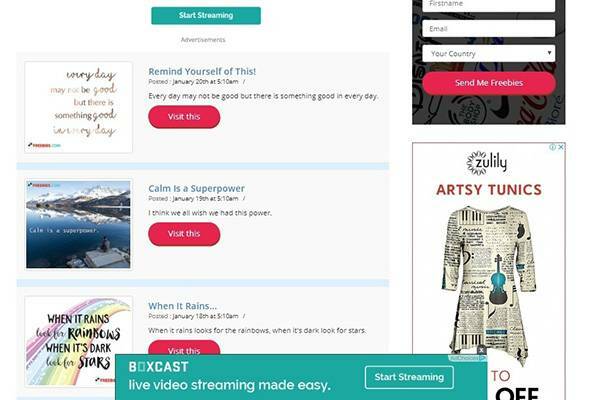 You get all the features and services, plus promotions, bonuses and more. The overall functionality is exactly the same as what you would get if you were logging into the site from your desktop or laptop device. There are several interesting ways in which participants can earn freebies in the form of actual physical prizes or in points which you can use to ‘buy’ items on the website. Video Submission: Freebies.com mention that the easiest way to earn points on their site is by creating your own YouTube video and submitting it to their website. 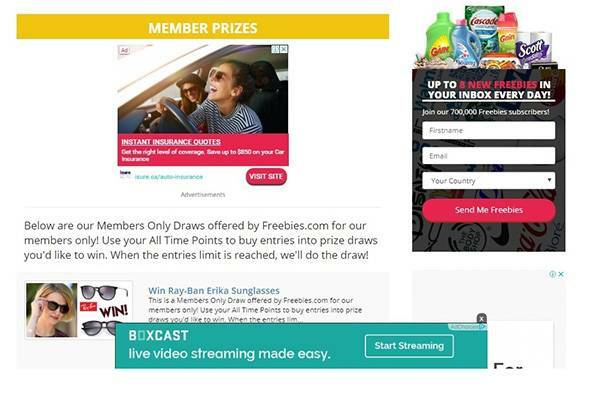 The video needs to contain a personal view of the Freebies.com site and you need to mention certain details like the prizes you have won so far or the free stuff you have earned. Submitting your personal video will earn you 2500 bonus points. Points Hunt: Freebies.com will create random points hunting competitions on their website which gives members a cool and quick way to earn a lot of points. Members need to ‘hunt’ for the points by looking out for special icons hidden on various web pages. There are no limits to the amount of points you can hunt and each country where Freebies.com is available in, will have their own points hunt. The amount of points that you can hunt for range from 100 points on the low end and 1500 points on the high end. Refer a Friend: Refer a friend promotions are very common and are always welcome. Freebies.com has their own refer a friend program which you can take advantage of. When you tell your friends about Freebies.com and they sign up with them, you can earn as much as 1000 points instantly. There is no limit to the amount of points you can earn from referring friends to the site. Sign Up Bonus: Every time that you sign up to an offer you can earn yourself as many as 300 points. Freebies.com has an “Easy Points” dropdown menu where you can see what sign up bonus offers are available. Daily Visit: You can earn as many as 50 points just for visiting the site and seeing what’s new. Earn 50 points every eight hours. Riddles: Earn 50 points for every riddle that you solve on the site. Riddles are posted every day and you get 50 points for every one you get right. Even if you can’t solve it, you still get 25 points for trying. Trivia Questions: Similar to the riddles, answering trivia questions daily will earn you 50 bonus points for every one you get right. Again, even if you can’t get the answer right, you still get 25 points for trying. Polls: Completing various opinion polls will earn you 50 points per completed poll. 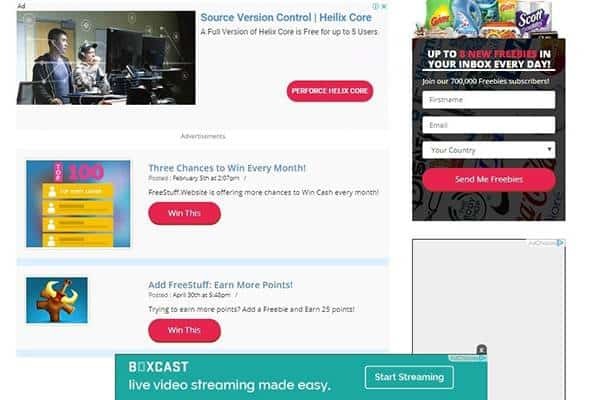 Freebies.com posts at least three polls a day, giving you an easy way to earn additional points. 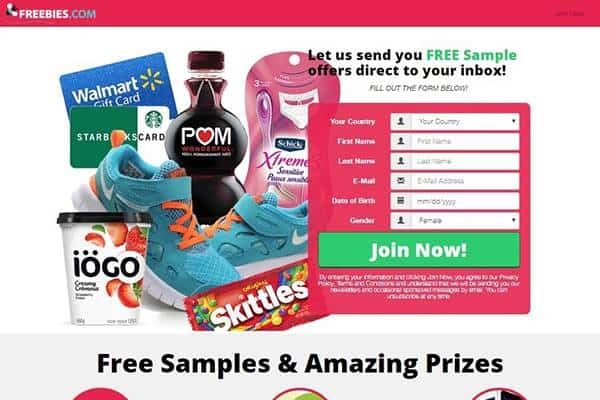 Open email links: Freebies.com sends their members emails containing information related to various promoted products, prize draws and giveaways. The emails also contain links to various polls, quizzes and riddles and if you click on these links you will automatically earn 15 points. In addition, you will earn points for completing any of the polls, trivia questions or riddles. 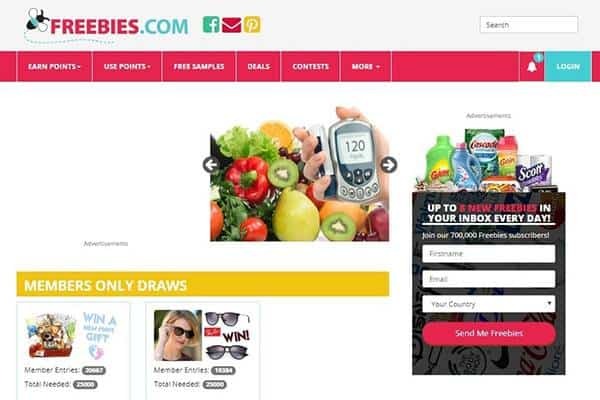 Since Freebies.com isn’t a conventional online lottery site, there is no need to add your Visa or MasterCard credit card or any other payment option to your personal account at Freebies.com. Freebies.com is a promotional site for a wide range of companies to promote various products on. Entry to the competition giveaways is free of charge and you will not be asked to pay any money to enter any of the draws. Winners of the draws are notified personally via email and further arrangements on collecting prizes are usually made then. Freebies.com customer support consists mainly of an email contact form. If you need to get hold of someone at Freebies.com, or you find the lengthy explanations of how things work still confusing, you can fill in the simple email contact form and send it to the Freebies customer support team who should get back to you in less than 24 hours. Before sending off your contact form email, taking a look through their frequently asked questions section may provide you with all the answers you need and save you some time too. The FAQ section addresses all of the most common questions that participants have when visiting the site for the first time and is quite comprehensive. Is Freebies.com legit or fraud? Freebies.com is one of the biggest free stuff sites on the web, and one of the oldest. Freebies.com gives away thousands of prizes and free gifts every month sourced from hundreds of legitimate and well-known companies. Freebies.com is one of the safest ways to get free stuff without having to register any details other than your email address. However, in order to participate in daily cash prize draws or high value prizes. Freebies.com has a long track record of excellent service, with very few complaints against them. They also filter all offers and read through all terms and conditions of those offers before posting them for their members. Freebies.com is one of the few online sites that provide an excellent and fun way to earn points and find thousands of great free gifts and promotions online. The site has been in business for close to two decades and is one of the best ways to find stuff for free online. No cash cost to enter draws. Earn free points to enter as many draws as possible. Only available to residents in Australia, Canada, Ireland, New Zealand, United Kingdom and USA.